A cross-sectional study (written survey) was conducted in an academic primary care group practice in Toronto, Canada. The participants were 93 patients over 60 years of age using a benzodiazepine for insomnia and 25 physicians comprising sleep specialists, family physicians, and family medicine residents. The main outcome measure was perception of benefit and risk scores calculated from the mean of responses (on a Likert scale of 1 to 5) to various items on the survey. The mean perception of benefit score was significantly higher in patients than physicians (3.85 vs. 2.84, p < 0.001, 95% CI 0.69, 1.32). The mean perception of risk score was significantly lower in patients than physicians (2.21 vs. 3.63, p < 0.001, 95% CI 1.07, 1.77). There is a significant discordance between older patients and their physicians regarding the perceptions of benefits and risks of using benzodiazepines for insomnia on a long term basis. The challenge is to openly discuss these perceptions in the context of the available evidence to make collaborative and informed decisions. Many older people suffer from insomnia and are commonly prescribed benzodiazepines for symptomatic management. Among adults aged 65 and older who live in the community, up to 42% reported difficulty falling asleep or staying asleep . The prevalence of benzodiazepine prescriptions in older people is also high: 22.5% of people aged 65 and older in Ontario, Canada reported use of benzodiazepines . Furthermore, older people are more likely to continue using these medications for extended periods once they are prescribed them . The research available on the benefits and risks of benzodiazepine use for insomnia in older people is surprisingly deficient for the magnitude of this issue. Notably, there are no prospective studies that have looked at the efficacy of benzodiazepine use for insomnia for a duration of greater than one month . Over the short term, meta-analyses show a mild to moderate treatment effect in quantitative and subjective measures of sleep [5, 6]. However, in practice, patients may be taking these medications for over a year or more. There are concerns about prescribing benzodiazepines because of potential adverse effects. However, there are no studies that clearly demonstrate adverse effects due to long term use of short acting benzodiazepines in older populations for insomnia. The evidence that does exist is limited by small sample sizes, short durations, or not addressing the population of interest, namely community-dwelling patients aged sixty and over. Benzodiazepines have been associated with increased risk in hip fractures [7–9], motor vehicle crashes , and cognitive impairment . The significance of these associations is unclear. While some studies have shown increased risks in long acting benzodiazepines, higher doses, or longer durations of therapy, others have shown none. Addiction and dose escalation are also widespread concerns, despite no long term studies to validate them. Similarly, the adverse effects of benzodiazipine withdrawl in older patients using benzodiazepines for insomnia are unclear. What is clear is that there is no consensus on the overall risks of benzodiazepine use for insomnia in older persons as the evidence to date is either inconclusive, conflicting, or anecdotal. With the paucity of clinically relevant and long term research in older populations, physicians lack evidence-based guidelines on how to advise long term users of benzodiazepines. Yet the common dilemma arises when an older patient requests the renewal of the benzodiazepine from a physician who has reservations due to the perceived risks. This study sought to quantify this potential discordance between patients and physicians with regard to long term benzodiazepine use for insomnia. The subjects in the patient group were recruited from the practices of thirteen family physicians in an academic family practice in Toronto, Canada. By reviewing telephone records, patients who renewed a prescription for a benzodiazepine from January to June 2001 were identified as potential subjects. Patients 60 years and older and receiving benzodiazepine prescriptions for greater than one year duration were included. The list of subjects was then reviewed by their respective family doctors. The physician could veto sending a survey to a patient for various reasons such as undue psychological distress of receiving the survey, inability to complete the form due to physical or cognitive impairment, or because the patient was not using the medication for insomnia. The physician group sample consisted of all staff and resident physicians at the academic family practice. It also included the sleep specialists in three academic teaching hospitals affiliated with the University of Toronto. The survey was pretested among a small sample of physicans and patients (n = 6) to ensure clarity of wording. Surveys were mailed out to all eligible patient and physician subjects. A follow-up mailing was conducted one month after the initial one to those who did not respond. Seven items including one for overall opinion were used to assess the benefits of benzodiazepine use. They were based on criteria described by Dement which included sleep latency, night time awakenings, total sleep time, and feeling of being well-rested on awakening . Improved daytime function and overall well-being have also been noted to be important clinical outcomes and were included . Regarding the risks, subjects were asked to respond to nine questions on potential adverse effects of benzodiazepine use that have been identified in the literature . These included daytime drowsiness, confusion, cognitive impairment, concentration problems, dependence, falls, hip fractures, motor vehicle crashes, and overall assessment of risk. The patients and physicians were asked the same items regarding their perceptions of specific benefits and risks of benzodiazepine use. While the patients responded based on their personal experiences, the physicians provided their perceptions for a hypothetical older person using a short-acting benzodiazepine on a long term basis. The survey employed a Likert scale ranging from one to five, which correlated to strongly disagreeing to strongly agreeing to the various statements. Additional information requested from patient subjects included the name of sleeping medication, frequency and duration of use, other methods used to help sleep, and comorbid conditions. The main outcome measures were the mean benefit and risk scores. A benefit score was calculated for each subject by taking the mean of all the responses from the questions on perceived benefits. Likewise, a risk score was calculated by taking the mean of responses from the questions on perceived risk. The scores potentially ranged from a minimum of 1 to a maximum of 5 as per the Likert scale. A T-test for independent samples was conducted to assess statistical significance between the scores for patients and physicians. The research ethics board of Sunnybrook and Women's College Health Sciences Centre in Toronto, Canada approved the study question and protocol. Two hundred and forty-two potential patient subjects were initially identified through review of telephone renewal records (Figure 1). Of these subjects, 44 were excluded by the family physician for various reasons, most commonly for undue anxiety (21) or no longer with practice due to death or moving (11). One hundred and ninety-eight surveys were mailed out. Five surveys did not reach their destinations. After two separate mailings, 131 responses were received from patients. Of these, 23 said they were not currently taking a medication for insomnia. Another 14 were not using a benzodiazepine, and three did not specify their medication. 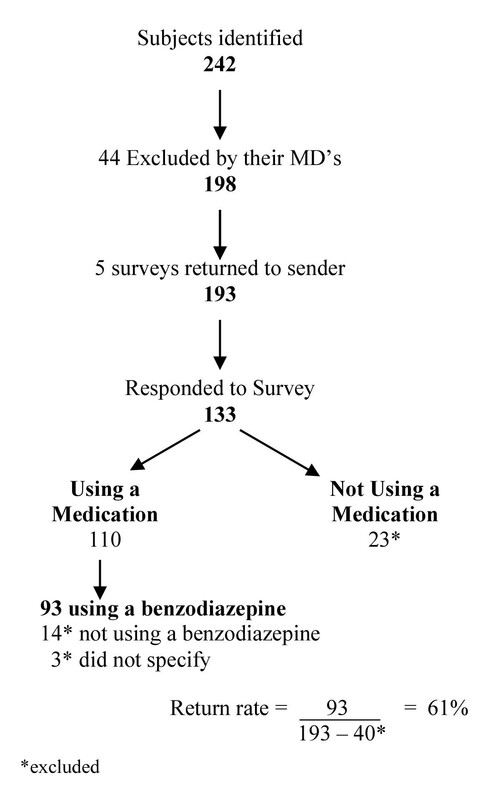 Ninety-three returned surveys from current benzodiazepine users were analyzed. The response rate was 61% for patient subjects who met the inclusion criteria. Thirty-nine potential physician subjects were identified (11 sleep specialists, 12 family doctors, 16 family medicine residents). Twenty-five surveys were returned. One survey did not reach its destination. The response rate was 66% for physician subjects. Table 1 shows demographic characteristics of patients who responded, did not respond, and those who were initially excluded by their family doctors. There was no statistically significant difference between the groups. The average age of responders was 77 years old. The percentage of female responders was 67%. The types of benzodiazepines used by the patient subjects varied (Table 2). Eleven percent were using a long acting benzodiazepine such as diazepam, clonazepam or flurazepam. Eighty-nine percent were using a short acting benzodiazepine, the three most common being lorazepam, temazepam, and oxazepam. Calculated mean benefit and risk scores for patient and physician groups are shown in Table 3. The mean score for perceived benefit from benzodiazepines among patients (3.85) was higher than physicians subjects (2.84). The difference of 1.01 was statistically significant (p < 0.001) with a 95% CI of 0.69–1.32. The mean score for perceived risk among patients (2.21) was lower than that for physicians (3.63). The difference of 1.43 was also significant (p < 0.001) with a 95% CI of 1.07–1.77. To our knowledge, this study is the first to directly compare the perceived benefits and risks of benzodiazepine use for insomnia in patients and physicians. It showed a clear discordance in perceptions. Overall, the patients felt there was generally good benefit in using benzodiazepines on a long term basis for insomnia whereas the physicians felt the benefits were neutral. With respect to the risks of using benzodiazepines, the patients generally felt they were low whereas the physicians felt they were high. Is this difference clinically relevant? We think this discordance is of clinical importance because it is likely not addressed explicitly in the patient encounter. Concordance is an important clinical issue in primary care. Recent research has demonstrated that misunderstandings between patients and physicians seem to be associated with patients' lack of participation and are often based on assumptions about medications that are not made explicit in the clinical encounter . There is also compelling evidence of a lack of open discourse between patients and physicians concerning the benefits and risks of prescription medication. The resulting discordance can lead to non-adherence or potentially adverse consequences of taking a medication. In the area of long term benzodiazepine use for insomnia in the patients aged sixty and over, there is a large gap in perceptions that needs to be addressed. Recent work in shared decision making provides a promising avenue of research to redress these gaps . Part of the reason for the discordance may be the perceptions in the medical community towards the risks of benzodiazepines. Due in part to the negative publicity and perceived high levels of risk, there has been a trend since the 1970s towards decreased use in benzodiazepines . The increased risks attributed to benzodiazepines have often been associated with long acting benzodiazepines or higher doses. Thus, small doses of short acting hypnotics, most commonly prescribed in this particular family practice, are generally viewed as safer. Although short acting benzodiazepines are not without risks in older people, the fear engendered in using these medications for patients is not substantiated by the current evidence. With perceived benefits from patients and no convincing evidence of adverse outcomes, it can be argued that a long term use of short acting benzodiazepines may have therapeutic value. Should an older individual who is distressed by insomnia, but consistently responds well to a low-dose short acting benzodiazepine be denied this medication? Like all medical decisions, the patient should be made aware of the benefits and risks in a patient-centred approach. For benzodiazepines, the potential risks include possible low level dependence and rebound insomnia on discontinuation. On the other hand, the potential risks of not treating persistent insomnia can also be significant . They may include poor daytime functioning, decreased mood, and decreased sense of well being. Decisions about using benzodiazepines for insomnia can be complex, and many factors in the patient's context should be considered. There is a growing amount of research available on alternatives to benzodiazepines for insomnia. Non-prescription sleep products  and newer short acting non-benzodiazepine medications such as zopiclone (Imovane®) and zaleplon (Starnoc®) are increasingly used by patients. Their role versus traditional benzodiazepines with respect to efficacy or harm has yet to be demonstrated . Furthermore, cognitive behavioural therapy (CBT) [17, 18] shows promising results of long term sleep improvements, and would be a non-pharmacologic consideration where available. There are a number of limitations to this survey. First, the sample for this survey was non-random and taken from a single academic family practice. Although there is no apparent reason to believe that these patients would respond differently to others in the community at large, generalizability is a potential issue. Second, the possibility of response bias may come from potential difficulties for some patients to complete the survey due to decreased cognitive or physical ability. Additionally, there is a possibility that respondants believed that a less than favourable account of their medication could result in its withdrawal. Finally, the goal of the survey was to quantify whether a discrepancy in the perceptions between patients and physicians existed. The reasons for this phenomenon were not explored. Further research in the form of in-depth qualitative studies with patients and physicians is required to further understand the reasons for this discordance. There is a significant discordance between patients aged sixty and over and their physicians regarding the perceptions of risks and benefits of using short acting benzodiazepines for insomnia on a long term basis. Patients feel that benzodiazepines are more effective than the physicians that prescribe them. Physicians have traditionally been taught that benzodiazepines are generally risky and perhaps dangerous in the patients aged sixty and over. This perception is not shared by the patients, nor supported by the literature for short acting benzodiazepines. When approaching insomnia in patients aged sixty and over, ruling out underlying medical and psychological disorders, medication causes, and environmental factors contributing to insomnia continues to be essential. Patients should also be aware of proper sleep hygiene and non-pharmacologic methods to treat insomnia that demonstrate evidence of being efficacious. Regarding benzodiazepine use in the patients aged sixty and over for insomnia, the evidence for safe and effective long term use is lacking. Thus there is an increased need for patients and physicians to openly discuss their perceptions with the available evidence to make collaborative and informed decisions. Recent research in shared decision making between physicians and patients points out promising directions for this possibility. LM was supported by a bursary from the Department of Family and Community Medicine, Sunnybrook and Women's College Health Sciences Centre. REGU is supported by a New Investigator Award from the Canadian Institutes of Health Research and a Research Scholarship from the Department of Family and Community Medicine, University of Toronto. The authors would like to thank Shari Gruman for her assistance in the preparation of the manuscript. LM was involved in the conception, design, data collection, data entry, data analysis and interpretation, and drafting of the article. REGU was involved in the conception, design, interpretation of data, and revisions of the article. Both contributors agree on the contents of the final manuscript.